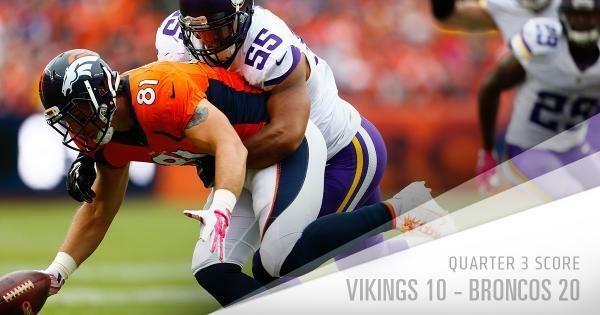 The Vikings head to Colorado hoping to hand the Denver Broncos their first defeat. Join in on the discussion as Andrew Krammer, Judd Zulgad and others react LIVE during the game with #1500ESPNLive. #1500ESPNLive is an experience like no other. You will get instant commentary, opinion, analysis and reaction to what is happening on the field. Enjoy real time videos, photos, audio and posts from around the world via social media. For those surprised that Smith wasn't flagged for helmet-to-helmet on Thomas, the point of emphasis is now where o-linemen line up. Injury update for the Broncos: WR Demaryius Thomas (neck) is QUESTIONABLE to return.
.@owendaniels ' Q3 TD was his 107th straight game w/ a catch — longest active streak by TE in the @NFL . Griffen still has cranial rectosis! Griffen is way overrated and overpaid! not as OVERPAID AS WALSH! Broncos WR Demaryius Thomas has been upgraded to PROBABLE (neck) to return. The @Vikings are backed up. Are you here? Are you being LOUD?! The invisible man KYLE RUDOLPH!
. 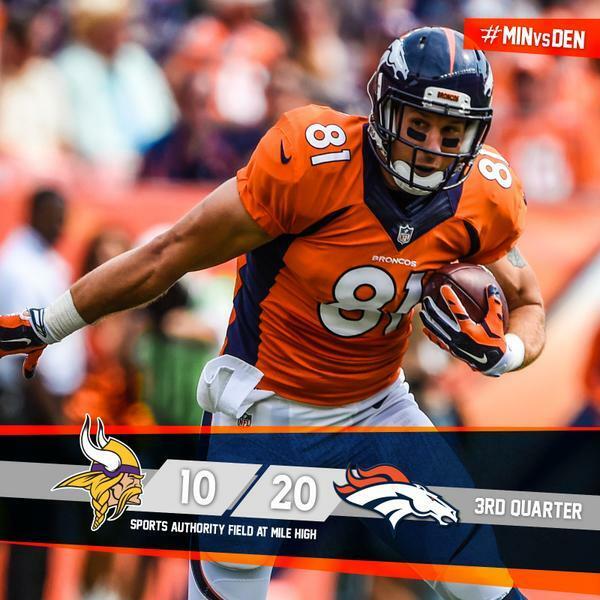 @athielen19 has tied a career-high with 4 receptions.
.@ceeflashpee84 gives the #Vikings a 1st down and DEN calls timeout. Adrian Peterson wasn't touched. Great hole by offensive line. "You've got a SEAL HERE... and a SEAL OVER THERE..."
#Vikings trail 20-17 following @AdrianPeterson 's longest run of the season goes for 6.
.@AdrianPeterson is now alone in 2nd in team history with 94 career TDs. There it was. Bridgewater under center and keep feeding Peterson. Eventually it works. #Vikings trail 20-17 after @AdrianPeterson 's longest run of the season goes for 6. Also great work by Bridgewater on 16-yard completion to Thielen on third down to set up Peterson fourth-down run. where did that blocking come from?